Selamat Hari Raya to all. Not too late right? Long holiday over here. School started Raya holiday since 16th July. Tomorrow start school lo . This holiday didn't go anywhere. Kinda "helped" Papa and Mamarazzi clear up the "jungle" garden . 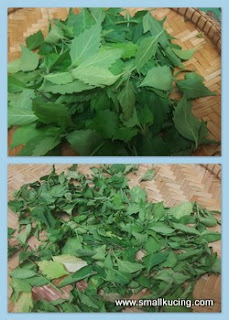 Managed to saves some Cat Whiskers's leaves for juicing and make tea. It's good for diabetes, hypertension and etc. Why la you ran away when your owner wanna catch you and bring you go for holiday? See! They left without you. End up have to beg for food everywhere. Some more you bring along your orange boyfriend/girlfriend come for breakfast, lunch and dinner ah? What happen to the owner? Also left for holiday ya. Speaking of eat..I went to the dentist yesterday. Got a hole in my tooth. Painful leh. Mamarazzi said cham la...dentist gonna put cement in the hole. I said NO, WAY JOSE! Kept looking to see what the dentist is doing. Lucky me. He said he is filling the hole with DURIANS. Yummy. Teeth okay liao....now can chase Happy Meal again lor. This month they having Thomas and Friends promotion leh. But not as bad as Minions promotion la. This one only have a new Thomas and Friends toy once a week. Oh. 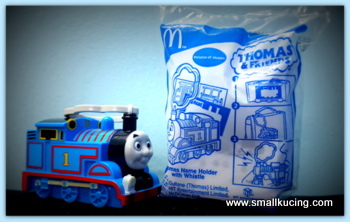 I did not know on Thomas promo in McD. Must check it out since my kids are into Thomas train and have a train rail set at home. Nice of you to feed the cats. Never mind, cats will return your kindness, we believe thay. Yes this round the Thomas and Friends toys good. That cat looks very slim. A long holiday is always nice, isn't it? Both the girls also kena plaster cement on one tooth just one day before the jab at school. Hopefully can get all 4 la. yeah esok school start, then smlm bro in law came telling son school holiday til Sunday. wah seh.. i was like.. eh your son also schooling leh.. not sure is it his son is til this Sunday as they in PD. The cat looks very thin. Tak cukup makan during the holidays. Hope your gigi ok liao. Hah I went to McD yesterday and they'd run out of both Thomas and Hello Kitty toys for the week. Had to pick one of their old toys. You are brave....I don't like going to a dentist!!! The dentist is always best once it is over! Sometimes the best holiday is staying at home and catching up and doing up the house. Poor kucing ... must reduce sweet intake already le! Oh, I misread your blog post. Haha! You were talking about cat whiskers and in the next photo showed a photo of a cat so I thought you meant real cat's whiskers. Oh, Thomas the Train is ramping up its marketing...they spent a lot to be in Ant-Man. Wah! 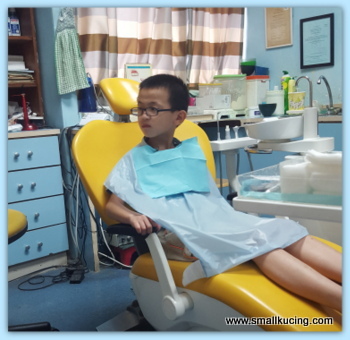 You so brave to see dentist at that age. I would scream and struggle when I was at your age. Why your mamarazzi tidy the garden so many times as seen in several posts!?? I don;t see any jungle except a tiger coming to eat the food as per your charity.